Every time I dig into the facts, the real data, the reports and contracts, I find that some vital "talking point" of the NRC in which they try to convince us that everything is under control....I find that there is a big mismatch between what is said and the reality. Did I ever mention that what you get out of a nuclear radiation cartel member is LIES! NRC pretends that they are making parent companies be responsible for the decomissioning. My take is that Nuclear companies will play every trick in the book to avoid actually doing the decommissioning. Up to and including bankruptcy of the Parent Company. This is messy, but not that bad. The strategy is simple....spin off your profitable divisions into their own seperate entity. Now the parent company is just holding the nuclear trash and the liability to decomm. No big deal, go bankrupt. But in Illinois, the hall of corruption, our president's training grounds, they authorized an even slicker plan. A new company called ZionSolution LLC (Limited Liability Company) was created to do the decomm. 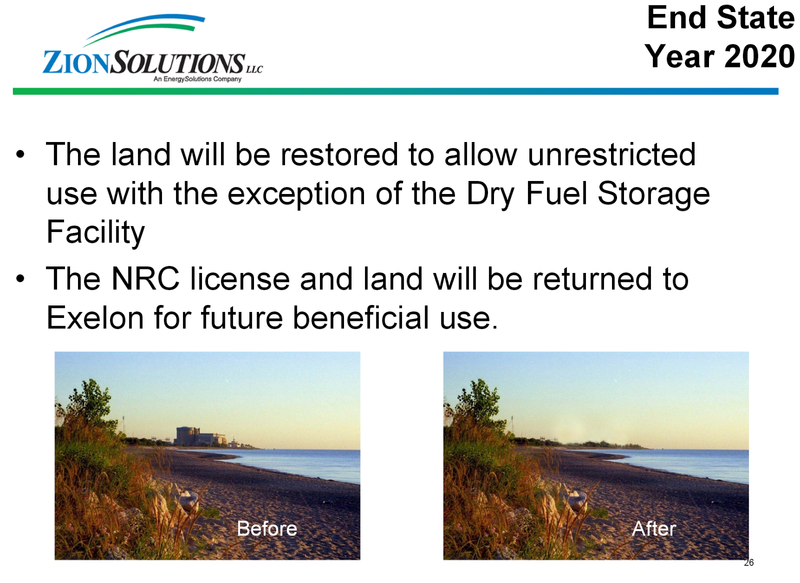 They "transferred" the NRC licensee to this new entity which has no assets and no other line of business to create assets with. And the transferred ALL liabilities and obligations. How the hell did the NRC allow this to happen? This ain't regulating, this is fool hardy. Here is the PDF summary of the contract. 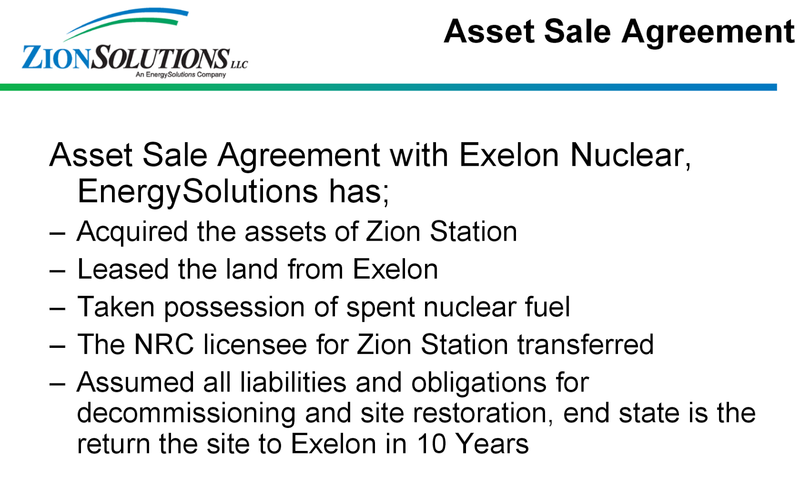 And the land gets returned to Exelon, not even to the people or the State. This is valuable beach front property.